Rebecca Krause-Hardie is a trainer, consultant, project manager, and partner in AudienceWorks, helping organizations use new media effectively. She has over 30 years of experience in new media, business, accounting, finance, and management, with a proven ability to get the job done. Upon graduation from the Juilliard School, Rebecca has had a varied and diverse career beginning with playing second horn in the Phoenix Symphony. Rebecca is a graduate of the fast-track League of American Orchestra’s Orchestra Management Fellowship program. She then spent 5 years as the Orchestra Manager of the Detroit Symphony, overseeing all aspects of the orchestra personnel, scheduling, operations, education programs, touring and recording contracts. 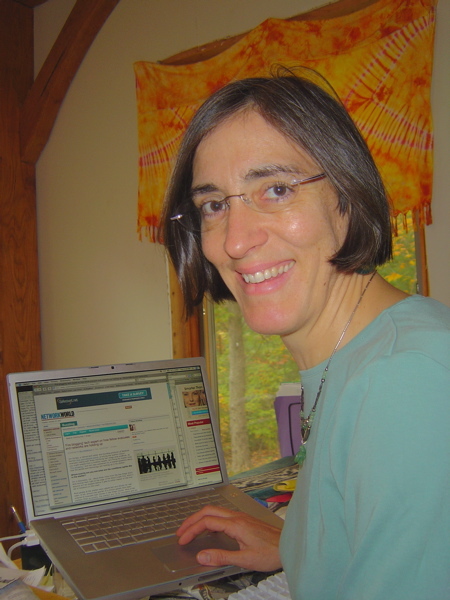 As Director of New Media for the League of American Orchestras, Rebecca created Playmusic.org, the first interactive music website for kids, and also developed national technology initiatives for the orchestra field. Clients include Dance/USA, Canadian Museum of Nature, Boston Symphony, New York Philharmonic, Detroit Symphony, MAPP International, Caring.com, Kansas City Symphony, Paul Taylor Dance Company, as well as numerous others. She was a founding board member of the New York Chamber Orchestra and plays horn regularly as part of Quattro Cor. Rebecca also teaches tai chi, and is a member of her rural call Fire and Rescue department. Rebecca has presented widely, coached and done trainings on social media and writes about performing arts and social media at her blog arts.typepad.com as well as ArtsReach and Polyphonic. Partner – AudienceWorks 1998-Current Services to non-profits including training, project management, website development, custom tool development, marketing and strategic planning. Worked with Caring.com in a year long project to train staff in social media tools, user test website and functionality, and grow online community. Provided a site review and analysis for Campaign for Catholic Schools with focus on social media and relationship management. Working with MAPP International to train staff in social media tools, create a strategic plan and implement social media activities. Working with Canadian Museum of Nature to complete a site analysis and social media plan in preparation for opening of new facility in 2010. Helped Kansas City Symphony design a special commemorative website on “War and Remembrance” in conjunction with performances of Baba Yar with Poet Yevgeny Yevtushenko that included digital stories from local high school students and invited community members to share their own stories. Developed ORBIT software in partnership with 6 orchestras, a web-based invitation tool for identifying and building audiences. Now in use by many performing arts groups. Managed a partnership of 4 orchestras as part of the Knight Foundation’s Magic of Music program. As the national expert in technology for the orchestra field, provided expertise, guidance, and leadership to develop tools to support over 800 orchestras across the country. Lead the production team to create a number of Music CD-Roms which were revolutionary in the multimedia field. Oversaw all aspects of the day to day operations of the orchestra including negotiations and compliance with all contracts and unions, concert production, operations, education, touring, and recording. Departmental budget of $9,000,000. Supervised staff of nine. As the CFO of this cutting edge multimedia company, introduced financial tools to control costs, predict future earnings, and was part of the senior management team that positioned it for its transition into one of the leading producers of DVD movies. Supervised staff of 5. Directed the Financial, accounting and operational activities of the partnership including financial statements, forecasts, budgets, and contract negotiations. When I arrived at the winery, the books had not been current for over 9 months. I was able to reconstruct, reconcile and bring all the records into a current position within a few months. Upgraded accounting and computer systems. Annual business over $8,000,000. Prepared financial statements, management reports, developed budgeting systems and was involved with computerization of accounting systems. Was the only employee able to regularly reconcile the complex receivable accounts. Prestigious one year executive training program working with the senior staffs of the Minnesota Orchestra, the San Francisco Symphony, and the Grand Rapids Symphony in all aspects of orchestra management. Traveled extensively in Europe and the USA, performing and leading master classes as part of the Harmonic Choir; trekking in Nepal and Tibet; visiting Argentina; often visiting parents when they lived in India for 10 yrs. My step-father set up computers in a school they helped build for ‘untouchables’. Designed & built (ourselves) a passive solar home. My partner & husband has worked professionally with solar energy leaders since1980, including solar PV projects with seawater distillation Baja, and Navaho Nation Solar PV powered 800’ deep well water systems. I am a teacher & student of Tai Chi since 1984.